From Trolls to Barbie, My Little Pony: The Movie to Paramount’s over-the-top and, frankly, ludicrous GI: Joe franchise, Hollywood has made no bones about mining beloved ’90s properties in its neverending search for a bankable franchise(s), But it seems DreamWorks Animation and 20th Century Fox have uncovered an unlikely hero in Captain Underpants. Dav Pilkey’s title character began life ’97, and the novel series has since spawned 12 books, three spinoffs and a built-in fanbase that grew up alongside Pilkey’s zany creation. Now, he’s on the verge of his big-screen debut, which is expected to light up theaters in the form of the wonderfully titled Captain Underpants: The First Epic Movie – because subtlety is a dying artform. Headed up by Kevin Hart and Ed Helms – arguably two of the most bankable comedy stars working in the industry today – the animated feature has been pitched as a “raucously subversive comedy” designed for the entire family. David Soren (Turbo) is orchestrating the action from behind the lens, directing from a script penned by Nicholas Stoller. 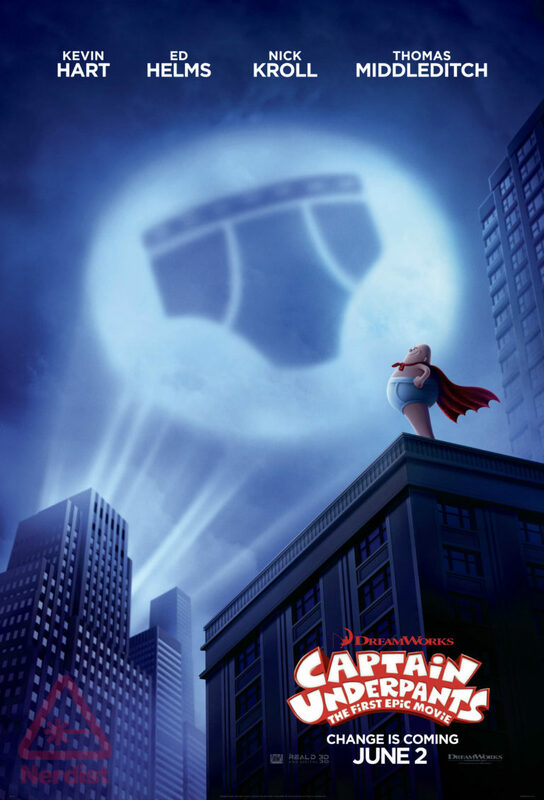 The latter recently had a hand in the woeful Storks, so here’s hoping Captain Underpants signals a return to form. Rounding out the cast list for this one are Thomas Middleditch as George and Harold, Nick Kroll as the malevolent Professor Poopypants, and Get Out director Jordan Peele as nerdy tattletale Melvin Sneedly. Captain Underpants: The First Epic Movie shoots into theaters across the U.S. and the UK on June 2nd and July 28th, respectively.